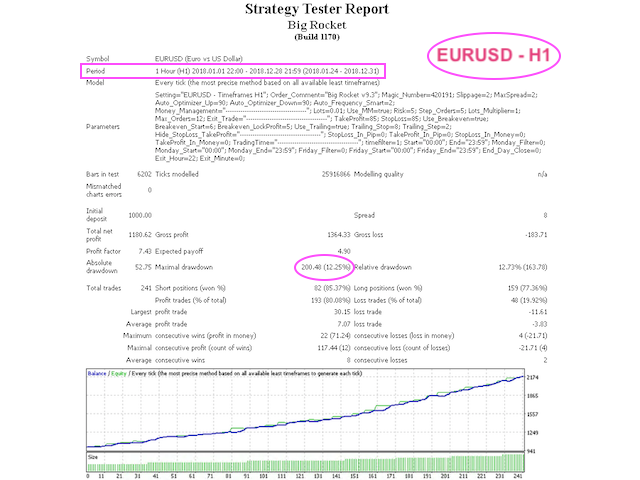 Robot forex "Big Rocket" is based on custom variation of MACD, CII, FIBONACCI, RSI and TOCHASTIC indicator in assistance of Auto Optimizer and Auto Frequency Smart module that allows for dynamic adaptation to current market conditions (no user calibration needed) - the specific result is chosen on the basis of several different coefficients. Multicurrency transactions can share the risk of loss. Flexible risk management system.Advanced algorithm for entering and exiting the market. About 1500 bars of history on chart. Requires an ECN account with minimal spread. Recommended initial capital 200+ USD (if minimum LOT=0.01) for each pair. Max Slippage: This will be your Max Slippage to open a trade. Max Spread - maximum spread, at which the EA is allowed to open and close positions. Step Orders - After how many pips the EA should open trade or look for signal to open. Max Orders - the maximum number of open orders. Lots - Initial lot size. Auto Lots - enable/disable auto lot calculation. Risk - amount of the deposit, on which Lot is to be used when Auto Lots is enabled. Auto Optimizer Up - last known Optimizer value, returned be EA in deinitialization process. Auto Optimizer Down - last known Optimizer value, returned be EA in deinitialization process. Auto Frequency Smart - Reference value simulation. Take Profit (pip) - real take profit in pip. Stop Loss (pip)- real stop loss. Breakeven Start (pip)- after how many pips in profit the breakeven should start. Breakeven LockProfit (pip) - How many pips will be the distance between SL and the opening price. 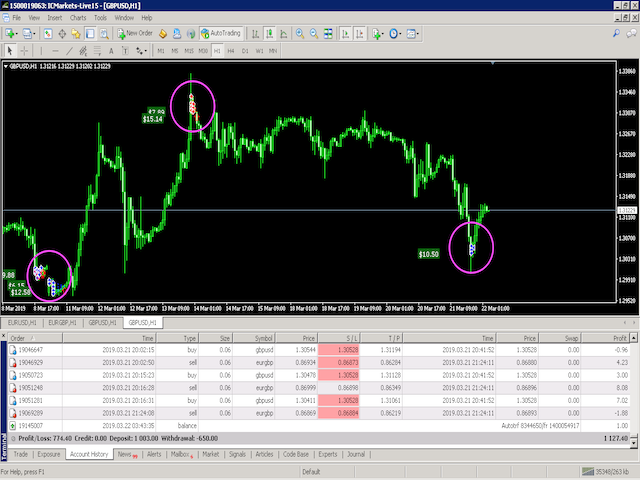 Trailing Stop(pip) - after how many pips in profit the trailing should start. Trailing Step(pip) - How many pips will be the distance between SL and the current price. StopLoss In Pip - This number is in Pip. TakeProfit In Pip - This number is in Pip. StopLoss In Money($) - This number is in Currency. TakeProfit In Money($) - This number is in Currency. Use Trading Time - Open Trade Time Start, Open Trade Time End. Magic Number - magic number for the Expert Advisor to identify its positions. Order Comment: Enter Here your preferred Comment.